Before: Flatwoods, a different kind of UFO case. The summer of saucers. We The People! Some back-story regarding the famous 1952 drawing of the so-called "monster" is in order. The aforementioned figure, that illustration for a hit TV show We The People the reader discovers, was inaccurately and so more dismissively portrayed at the start and for better than half a century... until Feschino, our intrepid and highly trained near-forensic illustrator, became involved. Truth revealed. During his investigation into the Flatwoods incident beginning back in 1991, and after a long hard slog to win the trust of journalistically betrayed witnesses and humiliated—so outraged—locals, Feschino worked closely with many of the persons actually involved in the incident, first hand. He communicated substantially with the predominately witnessing May family among many others. 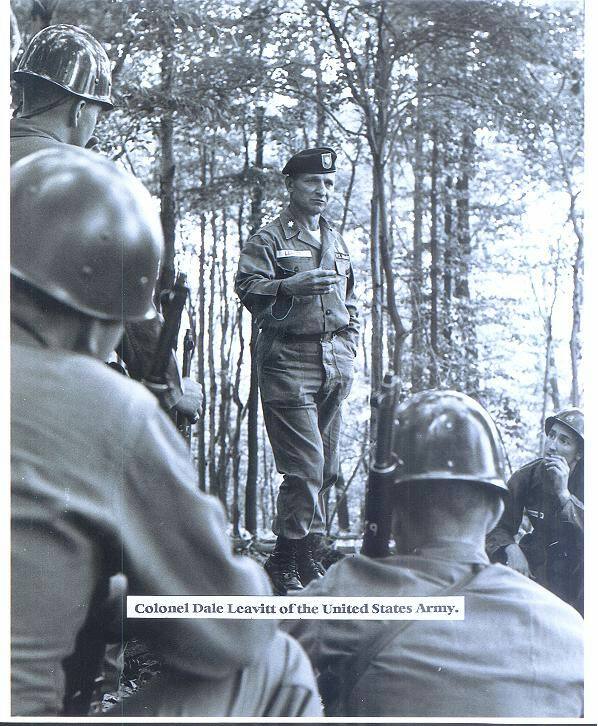 These included A. Lee Stewart, Jr., first responding co-owner/reporter of the Braxton Democrat newspaper, and Colonel Dale Leavitt, a "decorated hero of WWII" commanding the West Virginia National Guard in 1952. The Guard was called out a result of the Flatwoods affair. Quite a reaction for the performance of some hillbilly kids spooked in those same hills, one might wonder. The reader is reminded that Feschino talked with, otherwise interviewed, and visually recorded the testimonies of first-hand witnesses, only typified by matriarch Mrs. Kathleen May and her sons Freddie and Edward. This would happen, usually unpleasantly, numerous times over the years with regard to their close encounter with the "Flatwoods Monster." Feschino also worked with and later videotaped Stewart at his home in North Carolina over a period of days. 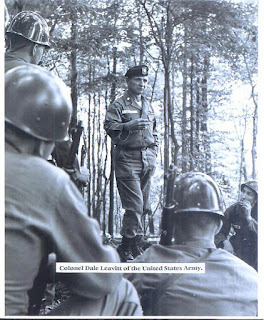 Additionally, Feschino talked to, taping for the record, Colonel Dale Leavitt on the Fisher Farm in Flatwoods about his substantive involvement in the case. The Commander of the West Virginia National Guard. The Colonel has an interesting story. He had actually become involved in the incident after receiving a call from the Air Force on the 12th, that fateful night in question. He had been ordered to the encounter site with a near battalion of troops carrying everything from boats to bazookas! Does this sound a little more involved than mere alleged crowd control for thousands of curious rubberneckers and thrill seekers? It was. More on the Colonel later. Moving along as there's ground to cover, Feschino then transcribed all of these interviews into his books. 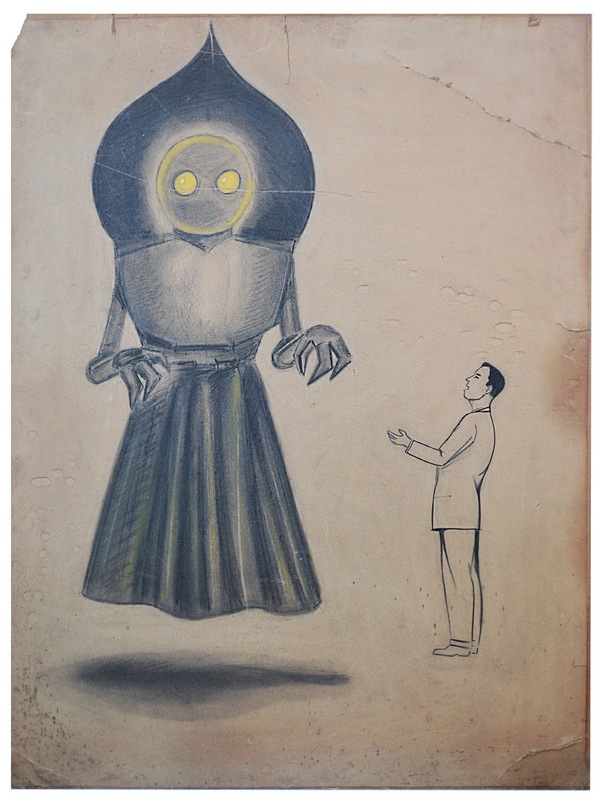 With his permission, I will explain what Kathleen, Freddie, Colonel Leavitt, and Stewart told Feschino about the 1952 TV drawing and the true appearance of the so-called, "Flatwoods Monster." 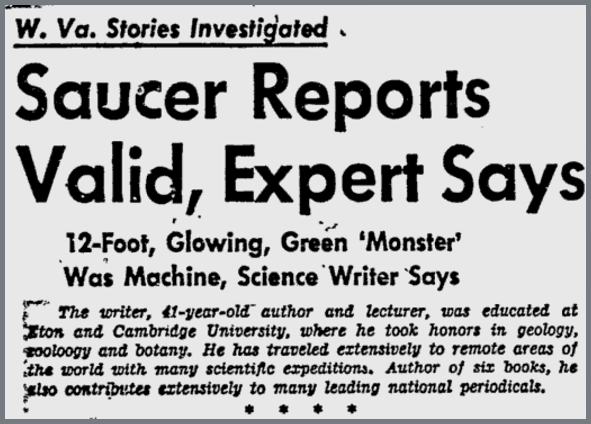 To begin, the reader will remember—and as previously discovered in Feschino's research—the witnesses, from the beginning, reported that the "monster" was actually mechanical and some sort of a "hovering craft" or "encounter suit"! 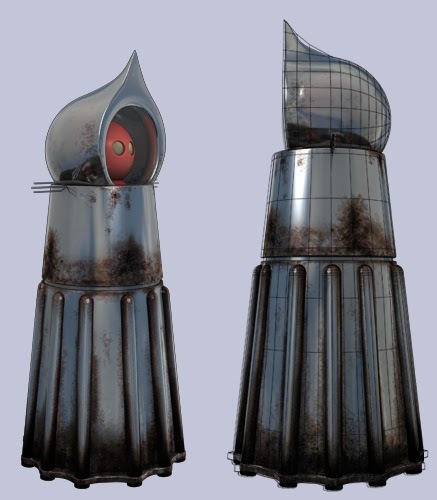 It appeared to be a lifting device or system emitting a noxious exhaust gas through long pipes. This is the description from the start! Revealed! The 12-foot-tall figure was NOT a claw waving mountain 'haint wearing a cloaked hood and a pleated dress as depicted on the We the People television show in 1952! As history records it, the reader discovers that the far-reaching tale of "a giant alien seen in Flatwoods" had gained the attention of an extremely popular television talk show in New York City titled, We the People. New York! The curious misdirection had its start there. Really, yes people, after only five days! New York! Big doings for the time! 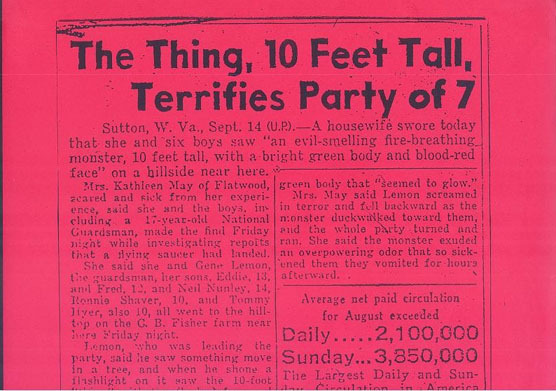 On Monday, September 15, 1952, The New York Daily News, reported the eye-catching headline, "The THING, 10 Feet Tall, Terrifies Party of 7." The article described the giant figure as a "10-foot tall 'thing' with the flushed face and green body that 'seemed to glow'." Furthermore, this particular article also gained the attention of Project Blue Book officials at Wright Patterson AFB. They clipped the article and archived it in their "September 12, 1952" case file identified as "Case 2078." Yes, reader, intelligence officials were keeping close tabs on this incident, which was quickly making national and global headlines and becoming a major focus for the media of the time! Remember, folks, this was the 1952 summer of the saucers! Shifting gears, in 1996, Feschino talked to A. Lee Stewart, Jr. at his home in North Carolina, as has been reported where the video interview had been taped. It was the first such interview Stewart had done since 1952! Stewart, remaining sharp as a proverbial tack, recounted his considerable participation. On the night of the incident, Stewart was called by the West Virginia State Police and asked to go to the May home ...on behalf of those police because those State police were unable to get to the area! See, something else, apart from the current story, howsomever related, had the State Police "occupied." I'll say no more about that other than "cue the ominous music." UFOs were in abundance and all over the United States coast to coast and border to border! The police were, at the same time, "occupied." The music climaxes! Back at the ranch, literally, the story continues as Stewart was the first person of officiality and authority to reach the May residence, hard-boil the witnesses, and actually go to the site of the fresh encounter on the Fisher Farm. On-site, he smelled the sickening sulfur odor, saw the disturbances in the field at the nearby landing site and later found a piece of debris in the form of a melted metallic-like substance. Most strikingly, he saw the fear of the witnesses. Why was Stewart contacted, one might ask. What officiality contacted him? Who gave him his authority? Stewart, a former Air Force veteran and respected photojournalist in Braxton County, owned a very sophisticated and professional camera for the time, and over the years had received many a call from the area police to accompany them through various accident and crime scenes to take photographs. Additionally, Stewart also broke the event to the Charleston Gazette later that night on September 12, 1952, and was justifiably credited with the whole breaking story. Mr. Stewart would be tasked and began handling the public relations through his newspaper, the Braxton Democrat which he'd owned in part. For weeks, he received calls from around the world! 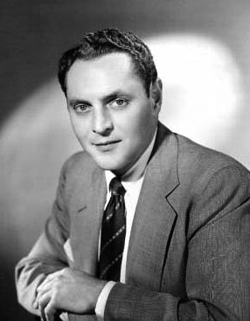 Later, on Tuesday, September 16, 1952, May, Lemon and Stewart were contacted by the top TV media of its time to appear as guests on the program already alluded to and talk about their involvement in the Flatwoods affair. By mid-week veteran journalist and science writer Everett Clark, who went to Flatwoods to cover the story, met and spoke with Stewart and reported, "He has had 70 or 80 out-of-towners call since that night." Mr. Clark also met with Mrs. May and reported, "Mrs. May has had more than a hundred phone calls from all over the United States." The story has captured the imagination of the entire globe! On September 18, 1952, Mrs. May, Eugene Lemon, and A. Lee Stewart were subsequently flown to New York City as guests of the hugely popular TV talk show hosted by Daniel Seymour and stayed at the luxurious Belmont Hotel. That afternoon they were driven to the TV studio for the live broadcast scheduled to air live later that evening. It was an extremely intense experience entirely out of the wheelhouse for innocently provincial West Virginians, to say the least. But then, they'd seen a "monster" and lived to tell the tale. Before the show, Seymour, his staff, and a sketch artist for the program sat down with May and Lemon, interviewing them pointedly about their experience. They asked them to describe the figure and appearance—some likeness—of the "monster." The artist "sketched out" the described being on a huge 24x36 inch illustration board—and rather too hastily reader, logically, given major newspaper articles had already preceded the arrival of the party from West Virginia, garnering New York's interest in the first place! No, the artist sure lost points for not producing what was described in print and person and of which he must have had some prior knowledge! I suspect that logic may be impeccable. During one of their interviews, Kathleen May told Feschino, "They just told me they'd like to draw a sketch of it, and Gene [Lemon] and I together had told them what we'd seen, and he [the artist] drew the sketch." The original rendering resurfacing at last! "I told him that too, but that's what he drew on it. To make it look more like a monster, I guess..."
One must remember that Kathleen May, a high school educated woman of reasonable intelligence and by no means a "hillbilly" (one of the "Nickellsonian" skeptibunky slurs she and her town would learn to endure over time), was still a country gal humbly provincial in a 1952 New York City, New York. ...With everything moving around Kathleen at the speed of sound, relative to her, and most people of the time? She was justifiably intimidated. See, where she was from, in Flatwoods, with a population of only 300 people and well before the Interstates making travel more effortless, it took her hours of road time to get anywhere at all. Kathleen lived in a mountainous region where even the police sometimes couldn't get, at times, remember. Yes, reader, Kathleen May can be entirely forgiven for letting herself be pushed around by fast-talking New Yorkers, to a degree, with regard to the true likeness of the "monster." ...A deep Elizabethan bow to the memory of Kathleen May. The biggest misconception about the "monster," one is reminded, was of its overall appearance being described as cloaked in a dismissively inexplicable cloth garment, wearing a pointed hood and sporting a pleated skirt/dress like a teenage bobbysoxer. This was never the case. Besides, reader, where were the rest of the Barbie-doll accessories and accouterments, doting Ken-dolls driving motorless sports cars and living in plastic beach houses? This is sarcasm not uncalled for, reader. I'll wallow in it, and thanks. ...Sometimes enough's enough, eh? Sometimes it becomes too much! 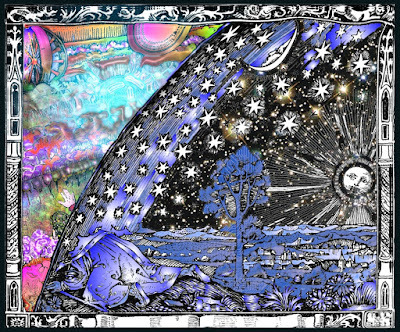 Hurdles, howsomever unintentional to genuine enlightenment on the broader subjects, especially the highly strange ones, become increasingly tedious and more difficult to bear as this writer ends the summer of his winter... I digress. Kathleen May told the artist that the lower portion, "was shaped like drapes" fluted and pleated. She tried to explain and stated, "It came out on the sides. It flared out." Frank then asked Kathleen directly about its appearance, "Did it look cloth-like or metallic?" She exclaimed, "No! It looked more metallic." At this point reader, the sketch artist took May's description literally and drew the "monster" in a cloth outfit wearing a dress, rather than the truer likeness, below. See, the realistic portrayal of the figure as described to Feschino during his interviews and also described to Stewart back in 1952 was a hovering mechanical device! ...Posted Monday, September 15, 1952, and, as pointed out above, and preceding the We the People interview (so they should have known)! 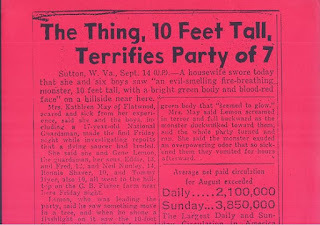 The Charleston Gazette posted an article containing this information about the accurate description of the "monster." This was obtained by Stewart during his interviews with the witnesses back in Flatwoods. This article, "Braxton Monster Left Skid Tracks Where He Landed—(Special to The Gazette)," actually precedes the incorrect portrayal of the TV show "Monster" drawing... by five days! The witnesses gave the actual description regarding the "monster," at the start! We the People really can't claim ignorance when it was this initial report crossing their interest threshold, initially. It "...Wore a suit of green armor. Looked like a mechanical man. Had a blood-red face. Sported a black, spade-like cowl which extended a foot or more above its head." Yes, Stewart got it right in his reportage. Five days later in New York, Kathleen May was trying to describe the pipes to the artist and likened them to the rolling pleats of drapes! The artist drew... drapes. C'mon! Given the artist must have been provided Stewart's report... the artist could have just phoned that in! Eyewitness Freddie May told Feschino, "What mother described as the pleats of hanging drapes, were actually tubes running vertically." He added, "They were metal, they were actually metal pipes" and compared them to the thickness of a "fireman's hose." Freddie also told Frank, "I think those tubes were some sort of propulsion system. It was hovering about one-foot off the ground." May also said this of the figure, "It was mechanical; it was not alive. Maybe inside of the thing—there could have been something alive." May added, "what I saw was either a small spaceship or suit of some kind. ...Something it was wearing. It was mechanical." Off the set, back in the New York studio, the TV sketch artist finished drawing the "Monster" illustration and handed it off to a crew member to be used for the opening of the live TV broadcast show later on. Mr. Seymour had finished talking with May, Lemon, and Stewart off camera, and the crew prepped them for their imminent interviews. Seymour strode out onto the set and took his place at center stage while the three Braxton County residents took their seats on set to begin their presentation. The live show began moments later when the camera focused on the master of ceremonies, Mr. Daniel Seymour. There was a hush. "Imagine a scene of the autumn dusk in a lonely and secluded spot, which you reach right after viewing a fiery meteor in the sky. This is easy to imagine." Suddenly, another camera cut swings us abruptly to the big drawing of the "monster," which was flashed on the screen as the orchestra music turned eerie, intensifying. Seymour, stated, "THIS WAS NOT SO EASY." Next: History hysterically distorted historically, the cover-up installed, and Charles Lindbergh's military aide demonstrates some real prescience.